Yesssssss! A day of triumphant entry! Every power standing between u and your Jerusalem of joy and peace, I command them to sommersault and die! In the name Jesus, shout Hosanna to the King of kings. Arise now and begin to challenge in battle every gate of envious robbers trading and gambling with the temple of your life, begin to whip them with the words of fire, I chase them out of your life and out of your path, in Jesus’ name. I speak to the gates of your Jerusalem of peace and breakthrough to be lifted up for you to enter into fulfilment now in Jesus’ name. O Prince of Peace, Ride into my life and flush out every storm troubling my destiny, in Jesus’ name! Every power standing between me and my Jerusalem of joy and peace, I command you to sommersault and die! in the name of Jesus. Every satanic opposition assigned to ambush my breakthrough, FALL DOWN AND BECOME MY CARPET OF HONOUR, to usher me to my throne and palace of breakthroughs, in the name of Jesus! As I shout Hosanna to the King of kings, let every battle assigned against be be disgraced at the gate of my Jerusalem, in Jesus’ name. Every spirit and every power trading and gambling with the temple of my life, I whip you with the thongs of fire and chase you out of my life, in Jesus’ name. 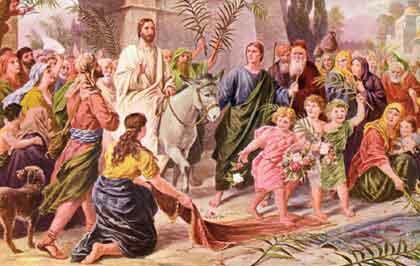 15 Comments on "Prayer Points For A Triumphal Entry Into Your Jerusalem: (Palm Sunday)"
As the Lord matches into Jerusalem, my business back home which has suffered set back in the hands of frauster will begin to blossom. My job will be restored. Every enemy of my destiny is whipped out of my way in Jesus name. He is alive. Hosana to the King!!! Alleluya!!!! Please pray with me that this year my ordained partner may locate me. Please sir, pray along with me that every satanic opposition assigned to ambush my breakthrough, shall fall down and become my carpet of Honour, to usher me to my throne and palace of breakthroughs, In the Mighty name of JESUS THE LORD. Thanks as you are doing this. Pls pray 4 me nothing works. The spirit of failure at the edge of miracles. Spirit of rejection. hi,pliz pray for me so that i get a powerful job and for God to prosper my husband and i in everything we do plus my daughter. Hi, pls pray 4 me that i may suffer no shame in my family. Also remember my husband he is not well. His stomach pains and he cant empty his bowl. Pray agaist the spirit of lust. Hallelujah! Glory be to the living God!! Hosanna to the King of kings! I am an overcomer, I am victorious in the mighty name of Jesus Christ! Today I enter into my Jerusalem of peace and breakthrough in the mighty name of Jesus Christ! I now possess my blessings by the blood of Jesus Christ!! Hallelujah!! Pl pray for me that mighty god will fulfill of my heart desire pay loan pay school salary for the month of july and buy a business truck for our own to meet all our needs.thanks for ur ministry. That the stagnation in my office and every area of my life will die by fire in Jesus Name. That marital failure in my foundation will die in Jesus name. That carrier failure in my foundation will die in jesus name. That infirmity in my life will die by fire in Jesus name. That reproach will die out of my life by fire in Jesus name. That every work of darkness that has been tomenting my life right from when i was born up to this day shall come to an end by fire in Jesus name. That my husband will locate me by fire for it is written that non shall lack her mate. Dear People of God, I desperately request for prayer for my sister(Florence),she needs a big financial breakthrough for rent, food and upkeep for the children. Her landlord is threatening to throw her out of the house with her children.May the lord open the heavens and give her finances and also something to do for sustainable income for herself and her family.